The Isle of Man has a rich abundance of wildlife, and as the Island’s only ‘all animal’ rescue centre the ManxSPCA deals with some unusual species that have gone native, including peafowl and wallabies. Both of these species were introduced to the Island and so they are not indigenous, but they have been living wild in the Manx countryside for so long now that they are accepted by most people as being an integrated part of the eco-system. 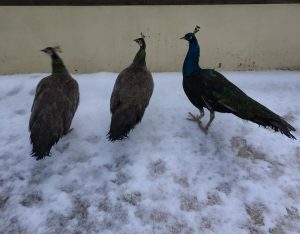 Facts and figures about peafowl are a little vague, as birds have escaped from private collections over the years and bred successfully. They are native to India and so one might be forgiven for thinking that the Manx climate would not suit them, but they have clearly adapted and their numbers are growing. We have more information about the origins and numbers of wallabies on the Island, though. in 1989 eight wallabies dug under their enclosure and escaped from the Island’s Wildlife Park. They bred successfully in the following years, living discreetly in the undergrowth of the Island’s plantations and wetlands. The current population is thought to be around 200. A common myth about the Island’s wallabies is that they suffer from blindness due to inbreeding. Research undertaken three years ago used camera traps, which are small camera boxes that can be attached to a tree or post and capture videos when triggered by movement. The cameras took over 1,000 videos of wallabies in the Ballaugh area, where the population is most dense, and many hundreds of videos were sent in by members of the public via a specially created Facebook page. A very small minority of these wallabies appeared to have any blindness, and when individuals did appear to be blind (presenting as a cataracts-like milky layer on one or both of their eyes) the problem was usually accompanied by other ailments such as an inner-ear infection, characterised by a tilted head. Given that it is likely there have been more escapes over the years than has been reported, it is probable that the gene pool is much larger than just the genes from the original escapees. The diversity of Manx wildlife may be surprising to some, but equally surprising is the fact that several mammals that are commonplace in the UK do not live on the Island. These include the fox, the badger and the squirrel. But there are plenty of smaller mammals and at the ManxSPCA’s rescue centre in Foxdale you will always be able to see hedgehogs, rabbits and polecats that are in need of care before they are released back into the wild. You can see lots of photos and videos on the Society’s Facebook page, and more detailed information about the charity on its website – www.manxspca.com.